Gary Power's failed sortie over Soviet Russia in 1960 prompted military brass to search for unmanned alternatives for performing recon over hostile territory. 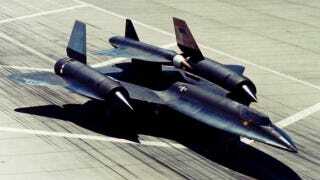 The D-21 drone was Lockheed's solution—launched from a modified A-12, it spied on Red China at over 2,000 MPH. Lockheed began its work in late 1962 on a high-altitude, high-speed reconnaissance drone. Originally dubbed the Q-21, the drone was built to travel at Mach 3.3 - 3.5 on the back of a Marquardt RJ-43 ramjet engine and to fly more than 3,000 nautical miles at an altitude of at least 87,000 feet. The drone was 43 feet long, six feet tall, and weighed 11,200 pounds with a 19-foot-wide double delta wing design over a titanium frame. It was also designed to travel just one way. The D-21 would carry a single high-resolution camera over a programmed flight path, then jettison the camera (which would parachute down for mid-air retrieval), and the drone itself would self-destruct. At least, that's how it was supposed to work. The D-21 was originally carried and launched from the back of a modified A-12 (the M-21—for "mother" as D-21 designates "daughter"). The drone was first successfully launched from this platform in 1966, the three subsequent test launches met with mixed results with the final test ending in a crashed A-12 and a drowned Launch Control Officer. After the fatal test accident, Lockheed quickly redesigned the droned to instead launch from under the wing of a B-52 Stratofortress (employing a solid-fuel rocket to jump-start the ramjet engine). In all, the D-21 saw very limited action on the battlefield, making just four sorties over the People's Republic of China as part of Operation Senior Bowl while spying on the Lop Nor nuclear test site.